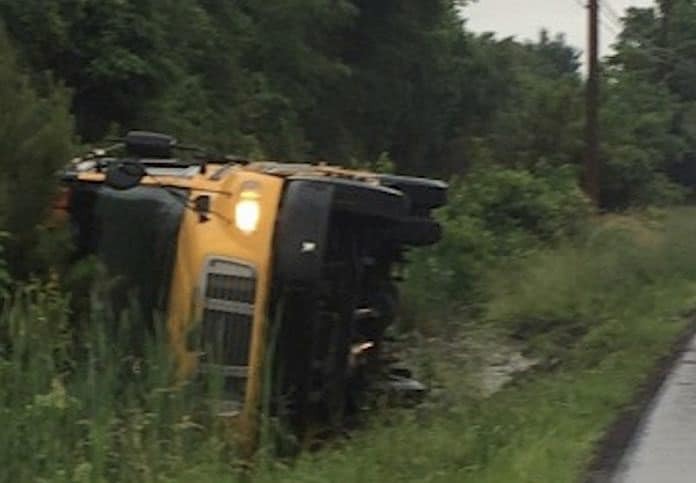 Stock photo of an overturned school bus. The Paramus, New Jersey school board voted to require its buses to be equipped with shoulder-restraint-style (three-point) seat belts for buses it is planning to purchase, for an extra $5,300 per bus. The board also said it will request bids for retrofitting all of its current buses with the safer-style belts, northjersey.com reported. On the same day, June 18, the New Jersey Senate & Assembly Transportation Committees held a joint hearing in Trenton, the state capitol, on school bus safety. The event focused on the deadly bus accident in Paramus on May 22. The Assembly Transportation Committee also passed three bills, one of which would require upgraded seat belts. According to mycentraljersey.com, some of the legislators expressed concerns about the advanced age of some school bus drivers. “Would you want that person to drive your child?,” asked Assemblyman Benjie Wimberly, D-Paterson. Some legislators were also very unhappy with how the New Jersey Motor Vehicle Commission and Department of Education do or do not notify school districts when license suspensions occur for any drivers.